This is actually a really great opportunity for me to test out my new capture device. I'll see if I can't get a bunch of scores submitted this week. Id be interested in participating if you know you had some other games besides Yars Revenge and Ladybug up for the competition in the 2600 category or am I reading this wrong? Edited by yarjr, Sun Sep 1, 2013 8:23 PM. There are other prizes that are not specific to those games. For example, most user points, most "First" trophies (which are earned by being the first person to post a score for any game, awarded after the score is accepted), etc. I think the other Frostbite scores submitted so far were Novice mode, so this may be the first Frostbite score in Expert mode. P.S. If anyone on here forgot to enter the "AtariAge" sign-up code when you registered (so you'll be in the contest), feel free to PM me and I'll add it for you. Edited by yarjr, Sun Sep 1, 2013 10:37 PM. Added several games for Intellivision, SMS, and Atari 8-bit to the database today. 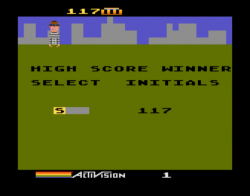 The Atari 2600 Kaboom score someone posted looks different. Is that a hack? And should Enduro be scored 245 day 2 not 2,450? Edited by roadrunner, Mon Sep 2, 2013 11:21 PM. Edited by yarjr, Mon Sep 2, 2013 11:26 PM. Can I delete my account somehow and re-register with the proper Code? 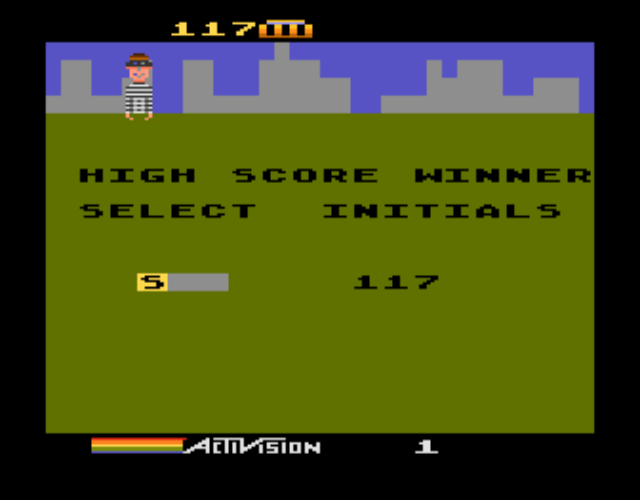 It's the Atari 5200 version of Kaboom, not the VCS version. No need. Just PM me your High Score user name and I will add it for you. "Right now, you need a minimum of 10 votes before your score will be accepted, and you will need at least 7000 percent of those votes to be "Yes""
My guess is it should read that you need at least 70 percent, not 7000. Yep, that's actually a bug. The percentage pass value was previously set to .70, and I changed it to 70. That page was multiplying the pass percentage value, which is why it ended up with that crazy number. I'm completely new to the Atari scene so I need some help with choosing the correct romset. Question 1: can I use the LadyBug_SP.zip romset available at the atariage website? Question 2: do I have to go for option a. or c. ? Ar these some kind of dip switch settings you can choose when running the game trough an emulator like Stella ? Yes, assuming that ROM is the same code that is on the cartridge sold in the AtariAge store, yes you could use it. However, it would need to be loaded (via Harmony cart, or some other method, like a Supercharger) onto a real 2600-compatible console. (Not an emulator). The idea was for this to be played using the Lady Bug cartridge in a real console, but as long as it is the same code running on real hardware, there's no practical difference. Expert mode is selected using the switches on a 2600-compatible console (via the difficulty switches). The only qualifying type of game would be what you listed as option c above (played in expert mode on real hardware, not emulation). A game played via an emulator would not qualify for this particular prize. I hope that helps. Please let me know if you have other questions. I'm glad you mentioned scores can be done via Harmony cart, I know one site that frowns on that and that disgorges me playing a selected game for them. I will however post Mame-scores ! 1. I would like to be able to post scores for Commodore Amiga 500 since I do own an original console I hope you will add this console....! 2. It would be nice if you could search by systemname on highscore.com. Would this be possible for you to add ?